American Mishima: こんにちは Konnichi-Wa Mia-Chan! So you are probably wondering why I have not written so much lately. We'll it's all led up to this beautiful moment some nine months in the making. 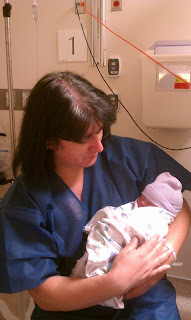 Little Mia-Naoko Rosas was born today on 11.07.2011. Both mom and baby are doing fine after ceasarian section at St. John's Hospital in Santa Monica California. This is my third child and the first for Tinahime who I am now spending a life together with. They say three is a charm and with this little girl I have no doubts whatsoever! Arigatou for your continued support! Thank you all! Domo arigatou gozaimashite!